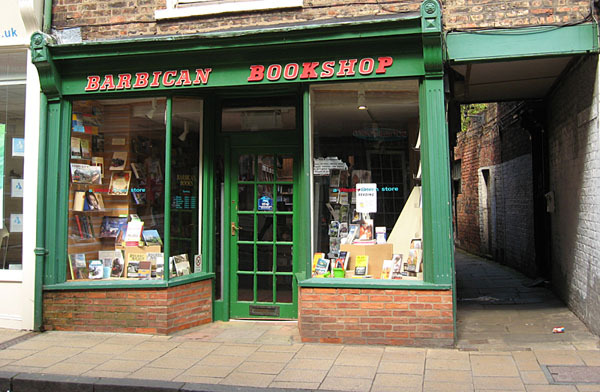 A photo of the Barbican Bookshop on Fossgate in York. Hastily taken, when passing, in June 2012. I didn’t stand in front of it and try to get its shopfront properly lined up. I’ve been looking in my photo archives to see if I had other, better photos, from earlier years. I can’t find any. I really thought I had more. But then I often think that. I often think I’ve got a photographic record of a particular place but really they’re just in my head, remembered like a photo, as I passed and looked so many times. I forget to take the photos I should take. I take things for granted because they’ve been there so long. Most of us do. Eighteen months on from the above photo. 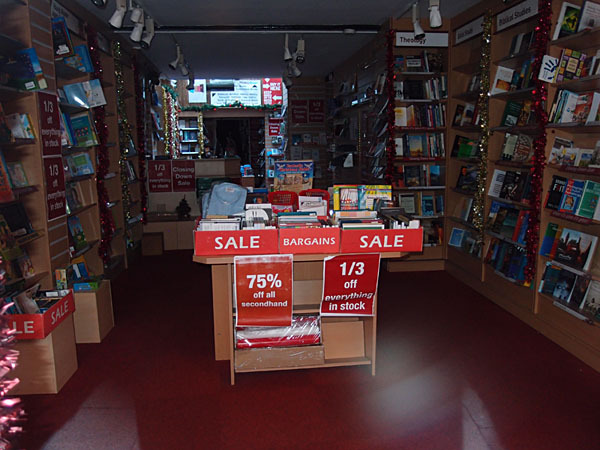 The Barbican Bookshop is closing down. 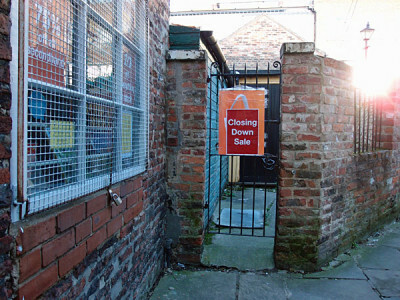 The closing down sale is advertised not only in the shop window but in the alley alongside. Not surprising that many bookshops are closing. Things have changed so so much. Our now traditional Christmas Day afternoon walk into town usually has a target or two. The target this year was this place, to get some photos when the shop wasn’t open and the street was quiet. 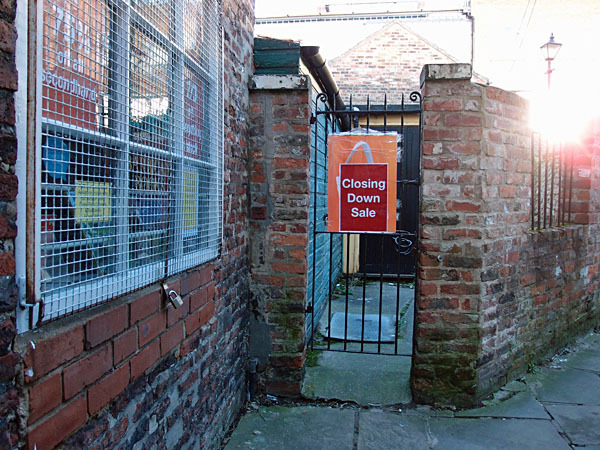 This one was taken through its closed doors, the interior of the shop, with its red and white signs advertising massive price reductions. Since summer 2012 the lettering seems to have been replaced on the shopfront, but it’s still red on green, and a bit 1970s, in a good way. They’ve been here on Fossgate for decades, with all those rooms of secondhand books in a shop apparently small when you see it from the front before you realise that it goes back such a long way from the street, and up narrow stairs. I’ve visited again, since taking this photo, and bought books. I’ve written about that too but don’t feel like sharing it. I hope to share some of the pamphlets and books of local interest I found in boxes at the back of the shop. But for now I just wanted to say goodbye, and thanks, to the Barbican Bookshop. It closes on 11th January. I visited the Barbican Bookshop in February 2013 and was pleased to see that it had not changed since the 1970s when I used to visit it as a student. Although much of the stock clearly never moved, there was so much of it, in so many rooms, that it always gave the impression that you were about to find something really good. If you happened to be an elderly theologian or railway enthusiast, your chances must have been quite high… Sorry to see another one go. I too visited on my annual Christmas pilgrimage to visit Mum. 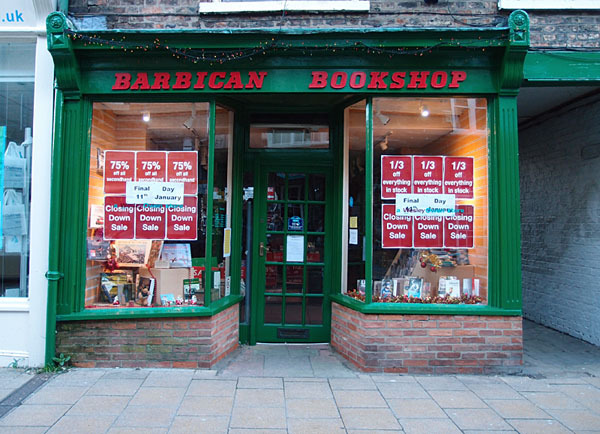 I always bought all my “York” books there and had some genuine “finds” including one with a picture of me aged 6 months! A sad loss. (the bookshop – not the picture of me). For those of us who like browsing York is becoming a desert. All that’s left is Waterstones which, in my humble opinion, is the cultural equivalent of Tesco. If it doesn’t sell, it’s off the shelf. No quirky sections; no specialisms and no heart. I too am sad to see the closure of the Barbican Bookshop. Over the years I’ve spent many hours browsing in there. Another of their specialities in the discounted section were the walking books, and I’ve bought quite a few of them from there. Some of these books have sent me off on fascinating explorations, others have expanded my knowledge of areas that I would love to get to. I shall miss the Barbican Bookshop greatly, not just in personal terms but as a very sad loss for the city. It always had a wonderful stock, and a very friendly and unpretentious atmosphere. The staff were great: a sincere thank you to them, and a fond farewell to a very special bookshop. I first recall attending in 1981. I was a student at Hull University in my first year and just a Christian. The staff here, especially Mr Bingham were always a joy to meet and get advice from. Over the years however far away I was I tried to visit and was welcomed back as a friend. This closure is a loss to the widest Christian community. Really nice to read all these comments on the Barbican Bookshop, thank you. Hope the owners and staff read them and know how much the place was appreciated.